The Best Table Tennis blogs from thousands of top Table Tennis blogs in our index using search and social metrics. Data will be refreshed once a week. Also check out Table Tennis Youtube Channels. Table Tennis newsletter is a comprehensive summary of the day's most important blog posts and news articles from the best Table Tennis websites on the web, and delivered to your email inbox each morning. To subscribe, simply provide us with your email address. About Blog TableTennisDaily shares Table Tennis content to the World. All the Latest Videos, World Tours, Articles, Discussion's, reviews and more! Facebook fans 177,069. Twitter followers 9,916. Singapore About Blog International Table Tennis Federation blog features all the news , information ,events about teble tennis globaly. The International Table Tennis Federation (ITTF) is responsible for the global sport of table tennis. Facebook fans 356,168. Twitter followers 34,021. About Blog A community for table tennis players, coaching and table tennis equipment to help you improve your performance. Facebook fans 1,073,560. Twitter followers 461,612. About Blog Comprehensive up-to-date news coverage on table tennis, aggregated from sources all over the world by Google News on Table Tennis. Colorado Springs, CO About Blog USA Table Tennis (USATT) is the national governing body for table tennis (ping-pong) in the United States. Facebook fans 66,615. Twitter followers 11,650. About Blog Pawel TableTennis shares videos about table tennis coaching and training. About Blog The channel "3T Table Tennis Training" shares videos of table tennis training at TSV Neuried. The videos demonstrates exercises performed by amateur players. Facebook fans 2,725. Twitter followers n/a. About Blog Table Tennis Federation of India blog shares news, information, videos related to table tennis globally. Facebook fans 4,642. Twitter followers 233. Portland, Oregon USA About Blog Paddle Palace blog shares news, information about table tennis. Paddle Palace Table Tennis Company has Everything for the Table Tennis / Ping Pong Player. Facebook fans 2,891. Twitter followers 373. Wilson, NC USA About Blog Butterfly Online Blog features news, information ,videos related to table tennis. ButterflyOnline is the North America distributor of Butterfly Table Tennis. Butterfly is a world leader in table tennis and ping pong equipment. Facebook fans 84,076. Twitter followers 7,975. Tenochtitlan, Tlalticpac About Blog Martin's Table Tennis Blog keeps you right up to date with all the latest information. Any time you want to discover how to improve your playing skills, choose your table tennis equipment, get to grips with the rules and discover more about this fantastic sport. Facebook fans 1,688. Twitter followers 28. Chicago, IL About Blog Killerspin blog shares news, information about table tennis. Killerspin is the leading American table tennis retailer and top ping pong event producer in the world. Killerspin’s premium quality table tennis tables, rackets, blades, rubbers, balls, apparel and accessories are used by some of the best ping pong players in the world. Facebook fans 562,323. Twitter followers 23,420. Milton Keynes About Blog Table Tennis England blog shares news related to table tennis. Table Tennis England is the national governing body for table tennis in England, responsible for representing, coordinating, administering, marketing and developing the sport. Facebook fans 14,486. Twitter followers 11,507. About Blog Whether you are looking for your very first ping-pong paddle and you have no idea what to choose or just want to get better at the game, I have you covered. PongBoss is a website that offers you the best table tennis tips on how to improve and guides you to make the best choice regarding your equipment needs. Facebook fans 233. Twitter followers 80. Laval, Qc, H7L 4Z7 About Blog Ping Pong Depot blog shares news related to table tennis equipments, events. Facebook fans 1,285. Twitter followers 119. USA About Blog The National Collegiate Table Tennis Association (NCTTA) is the official governing body of college table tennis in North America. Facebook fans 1,234. Twitter followers 1,071. About Blog Table Tennis Spot blog shares all the table tennis or ping pong information. Germantown, MD About Blog TableTennisCoaching.com Blog shares news, articles, information related to Table tennis coaching, schedules, players. Cambridge, UK About Blog Tom Lodziak Table Tennis Coaching blog shares post, news about table tennis. Tom Lodziak offers 1 to 1 table tennis coaching to players of all ages and abilities. Typically helps players with technique, consistency, footwork, attack, defense, service, returning serves, match tactics and more. Piscataway, New Jersey, USA About Blog MHTableTennis blog is the learning resource of international coach and player Matt Hetherington and includes technical articles on all areas of the game, along with interviews with a host of top international players. Facebook fans 8,011. Twitter followers 1,189. Philippines About Blog Green Paddle Academy is online academy for the thinking Pingpong player. Green Paddle providing everything from table tennis coaching, to equipment retailing and robot rentals. Facebook fans 7,555. Twitter followers n/a. About Blog Crazy Amateur Table shares compilations and other videos of traing sessions. Facebook fans 1,002. Twitter followers n/a. Hendersonville, TN USA About Blog Newgy's Blog shares news, information, videos about table tennis. Newgy Robo-Pong is the perfect partner/opponent for serious table tennis training, as well as recreational ping pong play at home & it provides a fun workout. Facebook fans 2,182. Twitter followers 1,871. France About Blog PingSunday helps you improve your table tennis skills with free coaching tips & lessons. Morrisville, NC About Blog Triangle-based Table Tennis center is dedicated to promoting Table Tennis as a life-long sport for players of all ages and skill levels. Facebook fans 932. Twitter followers 119. San Jose, CA About Blog Topspin is The American Table Tennis Club shares news, tips about table tennis. Facebook fans 2,741. Twitter followers 23. About Blog Table Tennis Planet shares table tennis news, videos and results from the major tournaments all over the world. You will be able to watch the videos from Chinese table tennis Superleague, Bundesliga, Russia and many other championships. Facebook fans 1,598. Twitter followers 508. Kuala Lumpur About Blog Persatuan Ping Pong Malaysia (TTAM) blog shares news related to table tennis globally. Facebook fans 1,641. Twitter followers n/a. Japan About Blog Table Tennis Table Tennis Equipments Blog shares news, tips, information related to table tennis bats, paddles, balls and more. Dublin About Blog This blog shares all the latest news from the Irish table tennis scene. The Irish Table Tennis Association (ITTA) is the National Governing Body for the sport of Table Tennis in Ireland and is responsible for the management and overall development of all areas of the sport, through the island. Facebook fans 963. Twitter followers 2,449. United Kingdom About Blog TTNews 365 is exactly that, a platform which curates all the latest, most interesting, relevant table tennis news feeds, blogs, media and social connections 365 days a year. Facebook fans 362. Twitter followers 66,526. About Blog Table tennis database rubbers comparison and blades for control ratings and reviews 2017. Table tennis, otherwise called ping pong, is a game in which two or four players hit a lightweight ball forward and backward over a table utilizing a little bat. About Blog TableTennista shares latest worldwide table tennis news. Facebook fans 20,061. Twitter followers 3,108. USA About Blog Ponguniverse Blog shares videos, updates, news about ping pong from players, coaches and enthusiasts from across the globe. Facebook fans 4,267. Twitter followers 316. About Blog Power Pong Table Tennis blog shares lessons, Expert advice on Table tennis tables, Ping pong paddles, Ball machines and more. Facebook fans 4,565. Twitter followers 715. England, United Kingdom About Blog BAT Foundation blog shares information related to table tennis equipment, therapy programs, and staff training to care settings specialising in dementia. BAT is a health & well-being charity delivering a table tennis Alzheimer’s Therapy Programme of medical research, equipment development and resource delivery. Facebook fans 11,578. Twitter followers 106. About Blog Gary Fraiman shares lessons, tips on table tennis coaching, training. Gary Fraiman USATT, Certified Regional Coach offers Table Tennis Lessons, table tennis/pingpong Training & Coaching. About Blog A blog about interviews with top international and national table tennis players. A collection of interviews with Olympians and National Team Members from all over the world. 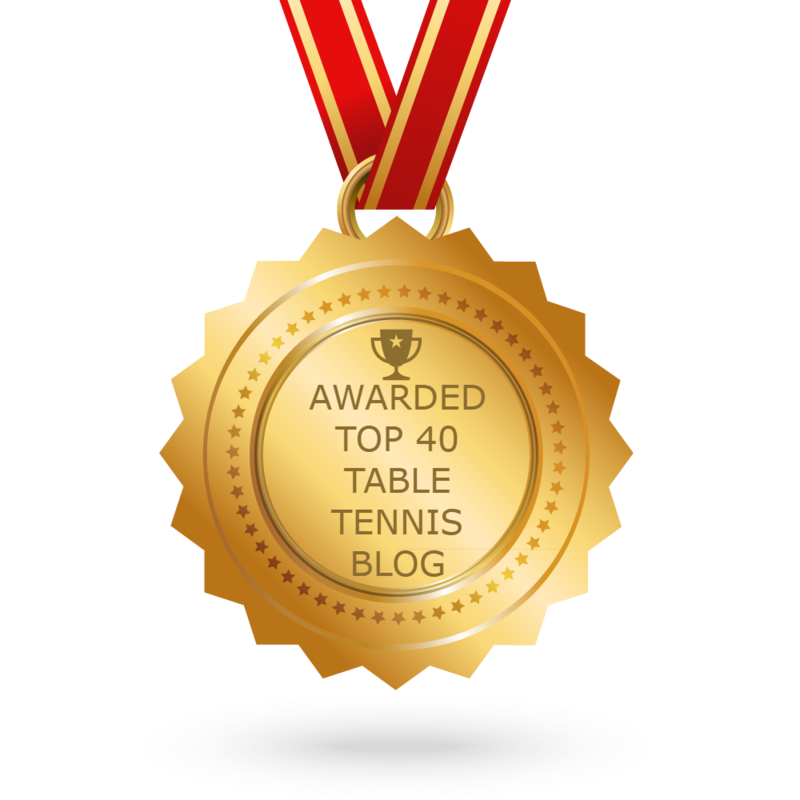 CONGRATULATIONS to every blogger that has made this Top Table Tennis blogs list! This is the most comprehensive list of best Table Tennis blogs on the internet and I’m honoured to have you as part of this! I personally give you a high-five and want to thank you for your contribution to this world.